There is just something about spring that makes me want to redecorate my entire house. The sun is shining, the birds are singing, the kids are playing outside and I am painting and rearranging furniture! hee hee. Be sure to follow the journey on Facebook or Instagram as there have been some epic thrift store finds, easy DIYs and fun crochet projects along the way. 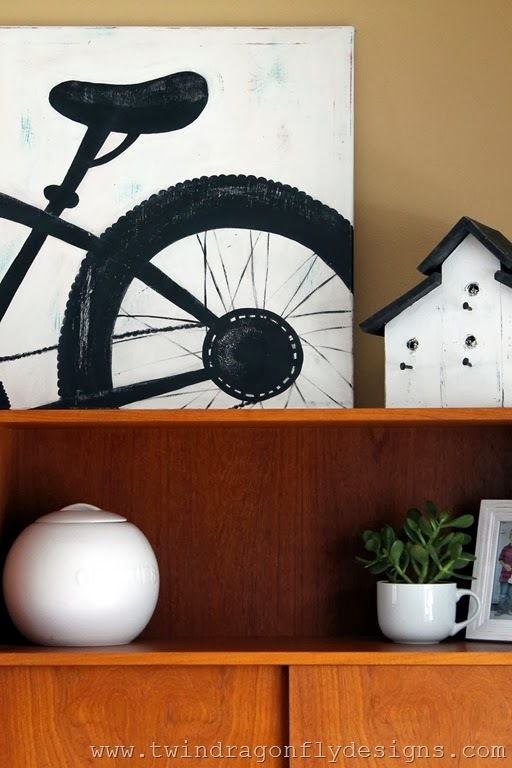 I found this great mid century modern danish antique shelving unit for our dining room and hope to style it with a variety of white knick knacks. It also needed something to accent the the top as there is a fair bit of space from the shelving unit to the ceiling. 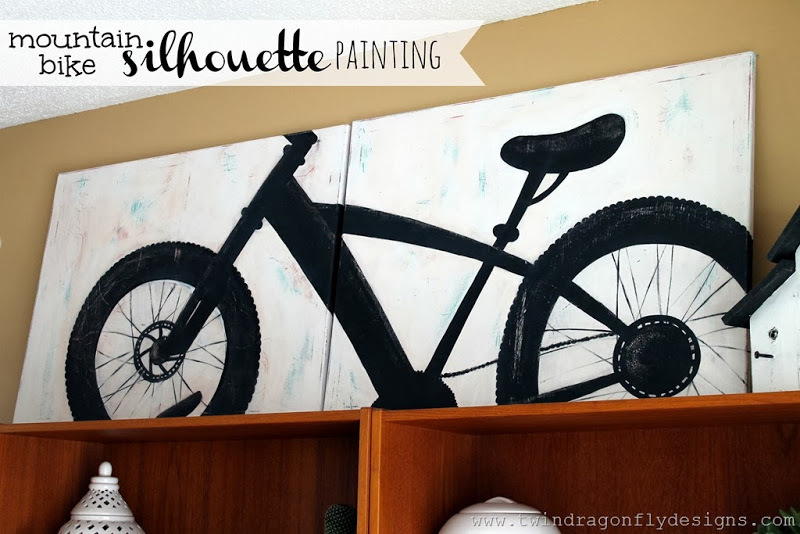 I created this Mountain Bike Silhouette Painting to tie the space together and showcase our love of biking. 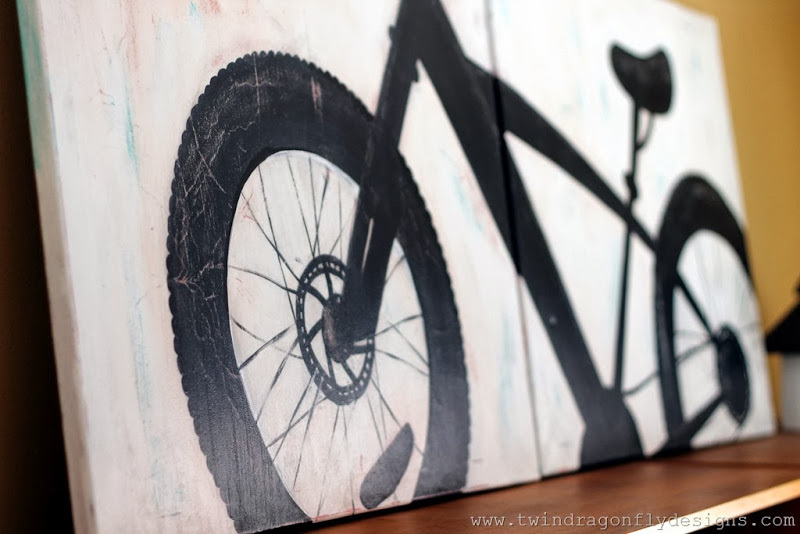 I used just a few simple supplies ~ two canvases, acrylic paint and a bit of sand paper. To create a distressed look I layered the canvas first with red paint, then sections of turquoise and finally painted it all white. 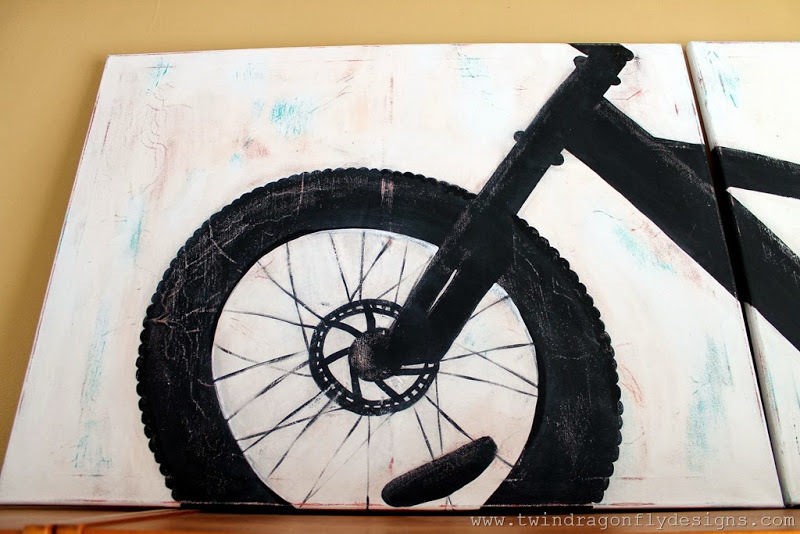 To create the silhouette shape I used a lamp to cast the shadow of one of the boys bikes onto the canvas. Then I traced the shadow with a pencil. I sketched other details free hand while looking at Darcy’s mountain bike. I painted this silhouette image in with black acrylic paint before finally sanding down various areas to give the entire canvas a worn look. What do you think? Dining room material or not? That’s so cool! I don’t have any artistic abilities so I definiteley admire those who do. This is so cute! I wish I was more artistic and could do stuff like that. Every room in your house should reflect the lives of the people who live there. The colors are neutral so if your dining room is not too formal, more fun and casual, I think this could work fine. Put it there for a week and see how it feels. Good job! What a neat idea! I wonder what other objects would work well for something like this. . .
Straight up AMAZING… I can hardly believe you free handed this! I’ve been in awe of how awesome this honestly is since I first saw it- love love love! You are so talented, Heather- glad you share it with us! I love this!! 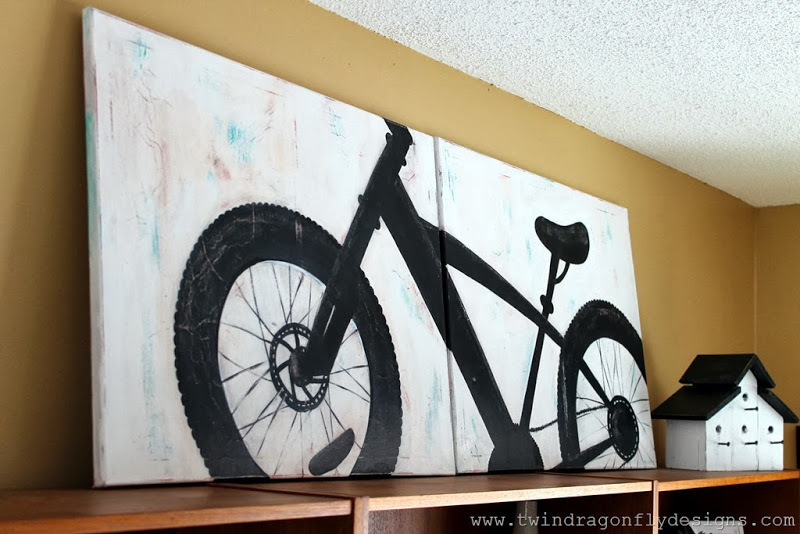 My husband is huge into mountain biking and this would be the perfect present. What size of canvas did you use? Thank you for sharing!